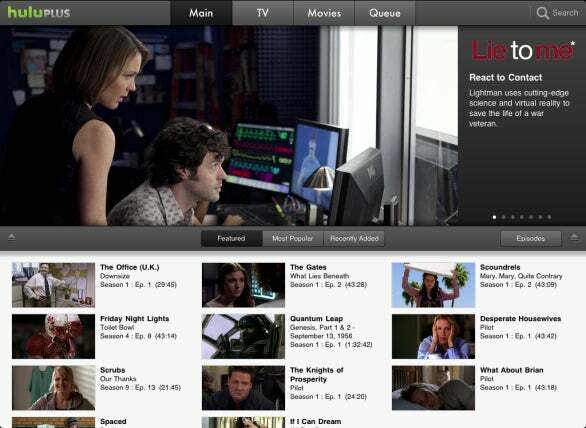 Hulu, the US-only online TV streaming service, recently announced Hulu Plus, a $10-a-month subscription service. Its touted advantages are support for select devices (including iOS devices and some gaming consoles and AV gear), full seasons of select shows, and content delivered in 720p HD. I managed to weasel my way into the plus-sized version of the service and take it for a test drive. Here’s what I found. Hulu Plus is available from a Web browser, just as is the free-version of Hulu. If you have a Hulu Plus account, all you need to do is log in with your e-mail address and password and the Hulu banner in the upper-left corner of the browser window changes to Hulu Plus. Otherwise the interfaces between the paid and free versions are quite similar. You can browse the service for popular and recently added shows, episodes, and movies; browse by channels (genres); and search for programs and movies. Where you see the real difference is in the amount of content you can view. Search in the regular Hulu and you find just over 20 episodes of Buffy the Vampire Slayer. Do the same with Hulu Plus and you can view every episode from all seven seasons. You can add episodes and seasons to a queue so that you can easily find them later. Additionally, with a Hulu Plus account you can watch some programs in a higher resolution. For example, the standard Hulu feed of the last episode of Lost was offered in 360p and was full of artifacts. With Hulu Plus I saw a much cleaner 720p version (though its playback sometimes stuttered). What doesn’t change between the two is commercials. Your subscription fee goes toward the features I mentioned rather than the removal of commercials. Just as with regular Hulu content, you see opening ads and the occasional short commercial interruptions (unless, if the option is offered, you choose to watch a much longer ad at the beginning of the program so that you can then watch the program uninterrupted). The Hulu Plus interface in the iPad version of the app is quite similar to the experience of viewing Hulu Plus in your Web browser. Four large buttons appear at the top of the screen—Main, TV, Movies, and Queue—a promoted show appears in a large flickable banner below these buttons, and then single episodes of featured shows appear below that banner. You can hide the banner and show more episodes with the tap of an arrow button. In this episode area you can choose shows by Feature, Most Popular, and Recently Added. Tap the Search button in the upper-right corner of the display and you can find content in a variety of ways, including by show, movie, actor, and network. When you tap your log-in name at the top of the screen you can choose to log out, view the details of your account, manage show subscriptions, see your viewing history, give feedback, and access the app’s settings (which are currently limited to turning sound effects on or off). The iPhone version of Hulu Plus is very cramped in comparison. 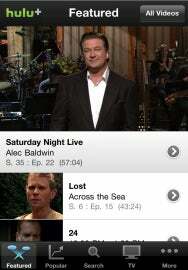 The main page features a single tappable banner and lists episodes below. Similar to the iPod app, the bottom of the display carries commonly used commands including Feature, Popular, Search, TV, and More. Tap More and you see Movies, Recently Added, Queue, History, Subscription, and Sign Out. And, just as with the iPod app, you can tap Edit and then drag these items to the bottom of the screen. Tap the All Videos button at the top of the screen and a selection wheel appears that contains All Videos, Clips, Episodes, and Movies. Choose one and you’ll see matching items below. Hulu Plus is smart about recalling partially watched shows. For example, I started watching the last episode of Lost on my Mac. I quit Hulu on the Mac and launched the Hulu Plus app on my iPad. When I logged in, a small window appeared asking if I’d like to resume watching that Lost episode. It started playing at a point a couple of minutes prior to the place where I’d left off. Jarring at first, I can now see the benefit of this kind of rewind to help you recall what you’d last seen. That said, while Netflix gives Hulu Plus more than a run for its money in performance, it can’t match its selection of current and recent shows that haven’t yet been offered to Netflix. However, Hulu Plus’ back catalog isn’t everything it could be. If you’re looking for complete seasons of today’s and the past decade’s most popular shows—Buffy the Vampire Slayer, The Office, The X Files, House, Glee, and 30 Rock—you’ve come to the right place. But while you can view all episodes from the latest series of The Simpsons, you’ll find only clips from the first season. And although Hulu carries The Mary Tyler Moore Show, you can forget about watching the legendary “Chuckles Bites the Dust” episode. The selection of movies is quite limited. There are handful of hits such as High Fidelity, but for the most part you see documentaries as you browse Hulu’s movie areas. Performance and content issues aside, Hulu Plus isn’t for everyone. It’s a terrific way to catch up on a show you’ve discovered half-way through the season. And it’s hard to beat when you’ve missed your favorite shows from last week. But those who object to pungling up for television programs—because, presumably, paying for Hulu Plus and coughing up for cable or satellite TV are two completely different things—won’t bite. If you like the idea of Hulu Plus because it provides one piece of the a la carte puzzle, you may still balk at joining a fee-based TV subscription service that subjects you to commercials. Those people interested in full-seasons of old shows will likely turn to Netflix for its better selection, viewing experience, and value. And, of course, the majority of the world has no access to Hulu.